Post your favorite photo on Instagram with the hashtag #SAIphotocontest and a short description by Wednesday, November 14th, 2018 at 11:59 PM ET. Must be a new upload, not the hashtag on an old photo. Please note that photos must be taken in an SAI country (Italy, Spain, or France). You can also email your photo with a short description to photos@saiprograms.com by Wednesday, November 14th, 2018 at 11:59 PM ET (extra points if you Instagram it though!). Voting on the top photos will open on Instagram on November 16th – don’t forget to vote! The winner will win a $100 Amazon gift card and a printed copy of their photo, while 2nd and 3rd place will receive a printed copy of their photos. Eligibility. This SAI photo contest is open to any SAI student enrolled in a Fall 2018 session. SAI will verify eligibility of each entrant. Photo must be taken in an SAI country (Italy, France or Spain). How to Enter. Participants should post one photo on Instagram with the hashtag #SAIphotocontest and a short caption by Wednesday, November 14th, 2018 at 11:59 PM ET. Must be a new upload, not the hashtag on an old photo. Please note that photos must be taken in an SAI country (Italy, Spain, England, or France). You can also email your photo with a short description to photos@saiprograms.com by Wednesday, November 14th, 2018 at 11:59 PM ET. Valid submissions must include participant’s full name, Instagram handle, and a short description of the photo. SAI reserves the right to dispose of any photo that it feels is inappropriate. Winner Selection. Top photos will be posted in a photoset on the SAI Instagram page, and the photo with the most votes (Instagram comments) will be the contest winner. To count as a vote, participants must comment the corresponding number of their favorite picture in the photoset, i.e if your photo is second in the photoset, all of the comments that are of “2” count as votes for your photo. Second and third place will be awarded to the participants with the second and third most comments. Participants are encouraged to share their photo via their social networks to get more votes. Voters must have an Instagram account; individuals can only vote once. Photo voting closes on November 19th 2018 at 11:59pm ET. Only one participant is eligible to win the photo contest. If the Instagram contest results in a tie an SAI photo contest committee will choose the winning photo. The contest winner will be announced on November 20th, 2018. Prize. The prize is a $100 Amazon gift card delivered via email. Second and third place prizes are printed copies of the participants’ photos. Prizes are non-transferable. Additional Limitations. SAI reserves the right to terminate, suspend or amend the contest. By participating (adding the hashtag or submitting via email), each entrant releases the submitted photos and agrees that they may be used for promotional purposes. The contest winner will be posted on the SAI website and social media! Contact information will not be made public. 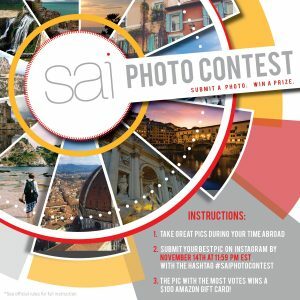 Entrants are not required to have a Instagram account; they may share the link to the SAI Instagram photo contest album via other social media platforms and/or email.